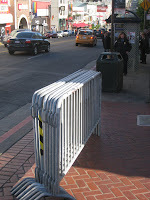 An SF City Hall insider tipped me earlier tonight that the SFPD was dropping off racks of barricades in the Castro in advance of an expected Thursday ruling on Prop 8 from the California Supreme Court. No confirmation at this point, but similar reports are coming in from San Diego. We'll know around midday when the Court posts its list of rulings for the next day. VERY RELATED: Thursday will also be the 30th anniversary of the White Night Riots, and Friday is Harvey Milk's birthday. You have to wonder if the Court is aware of that timing and what it may mean if they've decided to rule this week.